Origin and distribution: The Red Maasai sheep are also called Tanganyika sheep. They are sheep of the semi-arid regions of Kenya and Tanzania. Currently they are mostly found in the semi-arid regions of southern Kenyan and northern Tanzanian rangelands, especially in Kajiado District of Kenya and the neighbouring districts. Before the beginning of the 20th century, their keepers the pastoral Maasai tribesmen used to occupy much wider areas, including the wetter parts of Kenya's high and cool altitude plateaus, the upper eastern escarpments of the Great Rift Valley, such as the Kinangops, the lower slopes of the Aberdares Mountain ranges and the central highland such as, the once swampy areas of where the city of Nairobi is located. It is most likely that, through periodic alternate exposure to the wetter and drier areas, during the pastoral transhumance movements, these sheep were exposed to the notorious Haemonchus contortus parasite and tolerant and resistant strains of the breed emerged, as it is only the tolerant and/or resistant strains that could survive the alternate natural challenge and exposure to the deadly parasite as the Maasai moved their stock from wet to drier pasture areas and vice versa depending on the season and year. In fact, it is a strain of the so-called East African Fat tailed sheep that are kept by many other tribes in East Africa. If it were confined to the semi arid areas only, then it would have been difficult for it to develop worm resistance to the extent that it does, because it would not have been exposed to as much [CS Okeyo and Baker]. They are predominantly kept by the Maasai pastoralists as well as by the neighbouring tribes. Physical characteristics: The Red Maasai sheep is identified by its relatively large body size and the population that have been studied most is, the one that was initially selected from Kajiado District in Kenya and breed for coat colour uniformity and improved conformation at the Naivasha-Kenya, under the UNDP-FAO project from the early 1970. This strain is characterized by thick red hair. However, when all of the strains are considered, the sheep are multicoloured, the most preferred colour by the Maasai and therefore the commonest being red, brown and occasionally pied. Average height at withers is 73 (range = 72-75) cm for males and 62 (range = 58-66) cm for females (Kitivo et al. 1974; DAD-IS 2005; DAGRIS 2005). Average heart girth and body length for females are 75.1 cm and 63.3 cm, respectively (DAGRIS 2005). They are short, fat-tailed and slightly fat-rumped. In populations where a fat rump is a predominant feature indicate introgression of either Dorper or Black Head Somali/Persia sheep (See Pictures). Peculiarity: It resists worms and other diseases. On two indicators that together provide a reasonably reliable picture of resistance - faecal egg count and packed cell volume - Red Maasai ewes and lambs performed significantly better than Dorper sheep (Baker et al. 1999). The associated lowered mortality rates led to much faster flock growth and productivity. The number of one-year-old sheep available for sale in the Red Maasai flock was three times higher than in the Dorper flock (Baker et al. 2000). Studies are underway to identify quantitative trait loci (QTLs) responsible for resistance to Haemonchus contortus (Baker et al. 1999). The breed has also been shown to resist bluetongue virus infection (Davies 1987) and a more suited breed to survive under high trypanosome challenge (Wanyangu et al. 1993). Breed status: Despite its uniqueness in resisting endoparasites, there is no accurate population information among the pastoralists and mixed farmers who keep them. Red Maasai sheep population was estimated in 2002 at 235 400 for Uganda (DAD-IS 2005). No estimates are available for Kenya and Tanzania. 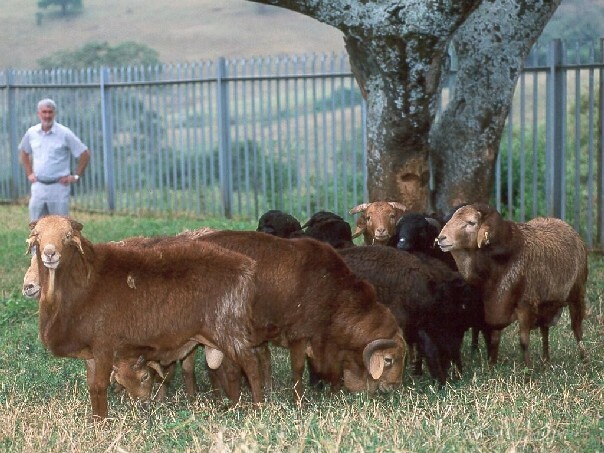 The government of Kenya and FAO, and Agricultural Development Corporation (ADC) through the Sheep and Goat development Project, initiated and keep nucleus herds at several stations in Kenya, where some selective breeding has been taking place since the 1969. However, the effectiveness of such programmes has been rather unpredictable due to inconsistent and inadequate funding and expertise. Utility: The Red Maasai are used for their meat and lard. Their reproductive performance in terms of lambing rate, is reported to be 80-84%, which is comparable to the Dorper sheep breed under medium rainfall zones in Kenya; the lambing interval is about 340 days, which is long as compared to other East African sheep breeds, but can be improved to 246 days when crossed with the Dorper (Kiwuwa 1983); the average litter size is about 1.13-1.21, which is lower than the Dorper and their crosses, greater than the Afar, Riverine Sudan and Black headed Persian breeds and similar to the Baggara of the Sudan. This is comparable only to the Afar sheep of Ethiopia, but lower than the rest of East African breeds (Kiwuwa 1983). Average birth weight, weaning rates and daily gain of 2.3kg, 97% and 128g, respectively have been recorded in research station herds in Kenya, with mature weights for males and females 45.5 and 35 kg, respectively (Chemitei 1978). Although average birth weight of the Red Maasai is about 2.7 kg with average weaning weight of 15 kg and adult live-weights are 41 and 32 kg for males and females, respectively have also been reported by DAD-IS (2005). Pre-weaning daily weight gain is 105 g for males and 98 g for females (Kiwuwa 1983). The weight of the Red Maasai weaned per kg female bred per year is known to be 561 g, which is still lower as compared to the Dorper, Riverine Sudan and the Black headed Persian sheep. However, it was reported that the mortality rates (28%) of Red Maasai sheep was superior to that of Dorper sheep (66%) under moderate to high nematode (Haemonchus contortus) infections (Baker et al. 1999). crosses between Dorper and Red Maasai performed 828 g (Inyangala et al. 1990; Inyangala et al. 1992; Wanyangu et al. 1993). The scope for control of helminthosis using treatments among the resource poor farmers is limited. That is why the Red Maasai sheep are recommended to pastoralist and smallholder farmers whose flocks experience a problem of severe haemonchosis (Baker et al. 1999). Baker R.L. 1998. Genetic resistance to endoparasites in sheep and goats. A review of genetic resistance to gastrointestinal nematode parasites in sheep and goats in the tropics and evidence for resistance in some sheep and goat breeds in sub-humid coastal Kenya. FAO/UNEP Animal Genetic Resources Information. 24:13-30. Baker R.L., Mwamachi D.M., Audho J.O., Aduda E.O. and Thorpe W. 1999. Genetic resistance to gastro-intestinal nematode parasites in Red Maasai, Dorper and Red Maasai X Dorper ewes in the sub-humid tropics. Animal Science (UK). 69(2):335-344. Baker R.L., Mugambi J.M., Audho J.O., Carles A.B. and Thorpe W. 2002. Comparison of Red Maasai and Dorper sheep for resistance to gastro-intestinal nematode parasites: productivity and efficiency in a humid and a semi-arid environment in Kenya. Institut National de la Recherche Agronomique, Paris (France). Proceedings of the 7th world congress on genetics applied to livestock production. pp. 639-642. Chemitei V.C.C. 1978 The sheep and goat production at various Research Stations in Kenya. Sheep and Goat Development Project, Ministry of Agriculture, Kenya. Technical Note No. 21. pp. 16. Davies F.G. 1987. Recent advances in virology at Kabete relevant to small ruminant production. Proceedings of the 6th KVA/Small Ruminant CRSP Workshop. pp. 206-210. Inyangala B.A.O., Rege J.E.O. and Itulya S. 1990. A comparative study of the Dorper and Dorper X Red Maasai sheep. In: Proceedings of the eighth SR-CRSP scientific workshop held in Research Institute for Animal Husbandry, Bogor (Indonesia). Small Ruminant Collaborative Research Support Program. pp. 195-206. Inyangala B.A.O., Rege J.E.O. and Itulya S. 1992. The performance of the Dorper and Dorper X Red Maasai sheep. Discovery and Innovation (Kenya). 4(1):76-82. Kitivo D., Makara C., Ogutu E.M., Owiti J. and Rakozi C. 1974. Some relatioship between body weight and body measurements of indigenous sheep. Sheep and Goat Development Project, Ministry of Agriculture, Kenya. Technical Note No. 10. pp. 6. Kiwuwa G.H. 1983. A review of sheep and goats in East Africa. Animal Genetic Resources in Africa. OAU/STRC/IBAR, Nairobi, Kenya. Second OAU Expert Committee Meeting on Animal Genetic Resources in Africa. 24-28 November 1983: Bulawayo, Zimbabwe. pp. 122-130. Wanyangu S.W., Mugambi J.M., Bain R.K., Duncan J.L., Murray M. and Stear M.J. 1997. Response to artificial and subsequent natural infection with Haemonchus contortus in Red Maasai and Dorper ewes. Veterinary Parasitology.69(3/4):275-282. Wanyangu S.W., Mwendia C.M.T., Bain R.K., Mungambi J.M. and Stevenson P. 1993. Production potentials of the Red Maasai and Black-headed Somali sheep under pastoral management conditions without trypanosome and helminth control. Small Ruminant Collaborative Research Support Programme, Nairobi (Kenya). pp. 167-180. Bain R.K., Wanyangu S.W., Mugambi J.M., Ihiga M.A., Duncan J.L. and Steer M.J. 1993. Genetic resistance of Red Maasai sheep to Haemonchus contortus. Small Ruminant Collaborative Research Support Programme, Nairobi (Kenya). pp. 120-126. Baker R.L., Reynolds L., Mwamachi D.M., Audho J.O., Magadi M. and Miller J.E. 1993. Genetic resistance to gastrointestinal parasites in Dorper and Red Maasai x Dorper lambs in coastal Kenya. Small Ruminant Collaborative Research Support Programme, Nairobi (Kenya). pp. 228-241. Baker R.L., Reynolds L., Lahlou-Kassi A., Rege J.E.O., Bekele T., Mukasa-Mugerwa E. and Rey B. 1994. Prospects for breeding for resistance to endoparasites in small ruminants in Africa - a new ILCA research programme. ILCA, Addis Ababa (Ethiopia) Technical Centre for Agricultural and Rural Co-operation, Wageningen (The Netherlands). pp. 223-227. Baker R.L., Mwamachi D.M., Audho J.O. and Thorpe W. 1994. Genetic resistance to gastrointestinal nematode parasites in Red Maasai sheep in Kenya. 5th world Congress on Genetics Applied to Livestock Production, Guelph (Canada). Volume No. pp. 277-280. Baker R.L. 1996. Characterisation and utilisation of sheep and goat breeds that are resistant to helminths. ACIAR Proceedings (Australia). No. 74. Australian Centre for International Agricultural Research. Australian Centre for International Agricultural Research, Canberra. Canberra. pp. 172-177. Daily Nation. Thursday, November 16 and 23, 2000. pp. 27-28. Kiriro P.M. 1994. Estimate of genetic and phenotypic parameters for the Dorper, Red Maasai and their crosses. ILCA, Addis Ababa (Ethiopia) Technical Centre for Agricultural and Rural Co-operation, Wageningen (The Netherlands). pp. 229-234. Mugambi J.M., Wanyangu S.W., Bain R.K., Owango M.O., Duncan J.L. and Stear M.J. 1996. Response of Dorper and Red Maasai lambs to trickle Haemonchus contortus infections. Research in Veterinary Science. 61(3):218-221. Reynolds L., Baker R.L., Sherington J. and Njubi D. 1992. Resistance to gastro-intestinal parasites in Dorper and Red Maasai-Dorper crossbred sheep. Small Ruminant Collaborative Research Support Programme (CR-CRSP). CR-CRSP, Nairobi (Kenya). pp. 131-137. Schwartz H.J., Schultka W., Engelhardt W.V., Rutagwenda T. and Schwartz M. 1987. Behavioural adaptation of indigenous sheep and goats to seasonal changes of forage supply on a semi-arid thorn bush pasture in northern Kenya. The Arab Centre for the Studies of Arid Zones and Dry Lands, Damascus (Syria). pp. 866-892.